It's Fox viewers who think Trump is the greatest president in history. No one else does. It comes after Democratic strategists have debated whether candidates and officeholders should appear on Trump’s favorite cable news channel to win over its regular viewers. Candidates like Sen. Amy Klobuchar have deliberately made efforts to speak to Fox News viewers, and the Democratic National Committee briefly entertained the idea of hosting a debate on Fox News before deciding against it. Republicans who don’t watch Fox News, for example, are over twice as likely to believe climate change is man-made, compared to just 12 percent of Republicans who watch Fox News. 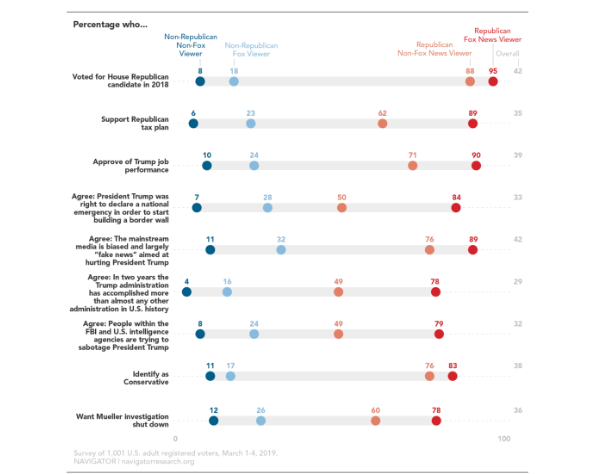 According to the poll, 78 percent of Republicans who watch Fox News believe Trump has accomplished more than any other president in history, compared to 49 percent of Republicans who do not watch Fox News. And 79 percent of Republican Fox News viewers said they believed people within the FBI and US intelligence agencies were trying to sabotage Trump, compared to 49 percent of non-Fox News viewing Republicans and just 8 percent of non-Fox News viewing registered voters who did not identify as Republican. We hear a lot these days about "Fake news" and radicalizing propaganda. Well, there you have it. It's not hidden in some dark corner of the internet or raised up to the innocent person's attention through sophisticated algorithms. It's right out in the open on your cable box.